Prepared using sodium-free Cajun seasoning, Campbell's Healthy Choice soup and 3/4 cup rice per serving. Season chicken with cajun seasoning. Heat oil in skillet over medium heat. Add chicken and cook for 8 to 10 minutes until browned turning once. Meanwhile combine soup, water, chiles and lime juice in a medium saucepan and warm over medium heat. Stir in sour cream and continue to heat through. 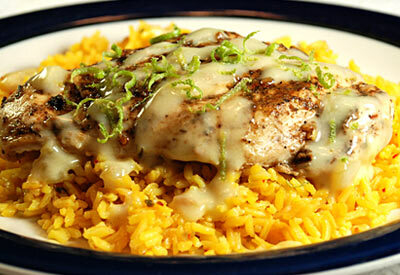 Place chicken breasts over hot rice and drizzle with chile cream sauce. Sprinkle with lime zest. Serve with additional sauce.